Click to enlarge. Photo credit: Eric Whitmire. The second type of biobot is equipped with an array of three directional microphones to detect the direction of the sound. The research team has also developed algorithms that analyze the sound from the microphone array to localize the source of the sound and steer the biobot in that direction. The system worked well during laboratory testing. Video of a laboratory test of the microphone array system is available at http://www.youtube.com/watch?v=oJXEPcv-FMw. Note to Editors: The study abstracts follow. Amazing! Roaches are known to be the best survivor among all organism. 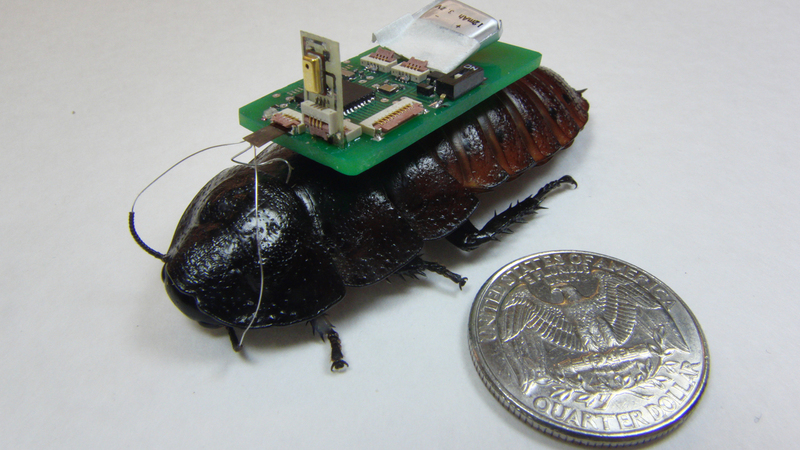 With this research and technology, roaches can actually be a useful contribution to science, instead of being labelled as a pest. Sensational. the advances of neural engineering. To a approach the next generation of bots. Congratulations. This is fascinating work. Can you share any information on the ‘backpacks’? I was curious about the RF link (2.4 GHz? BLE?) and the power source used. Thank you for your reply.